← When is a Horse a Fans of Bulls? Boy, the game is really taking its toll on these guys. Bro, show them how it’s done. Tree Mail comes and everyone seems really surprised that the game is still going on. Apparently a rumor was started that it’s just an Elite Eight this year and they all had started planning their speeches to the three members of the jury, totally positive that the game would feature no other twists or turns, certainly not another Immunity Challenge. But the rumblings proved unfounded, and, indeed, there’s an Immunity Challenge that afternoon. They also seem really concerned about losing their flame, which is weird because most of them voted for Michael. Now they finally understand what Corinne was talking about. Oh, no! Erik, remember what happened the last time you ate sugar?! We won’t be seeing him for a few hours. Brenda, who was already one of the favorites in the challenge, remains steadfast, holding out for something better, like pig brains. Cochran, however, voluntarily steps out of the challenge for three big hot dogs (insert wiener joke here). But it’s okay, he reasons, because they just need one person (or persons) to beat Reynold, and Cochran certainly wasn’t that guy. Anything upper body-based, yeah, Cochran has it. But he’s spent too much time working on those glamour muscles and he just doesn’t have what it takes to win this challenge. So why not leave it to the ladies? And Reynold would have achieved the upset, if it weren’t for all those cicadas he constantly had to swat away. Totally not fair. Like an October game at Jacob’s Field. Eventually, and unfortunately, the bugs get the best of Reynold and he penguin dives into the water. It’s down to Brenda and Andrea, and they go for a stupid long time. Seriously, just showing off. Like typical girls they can’t agree to just share the Idol – so possessive – but they do agree to lift one leg, just to get things moving. Immediately after that decision, Brenda goes overboard (or, perhaps, Jeff offered her some pig brains off-camera), and Andrea takes the win and the clue to Immunity Idol that Malcolm was crucially unable to locate. Brenda probably would have won if she didn’t spend all that time practicing the bone organ. Although, One-Eyed Willie’s treasure is probably worth more than a million. But it’s okay, because Andrea shares the clue with everyone! She’s like Scrooge after being visited by all three ghosts. And her loyal pooch Erik to digs up the Idol and brings it right back to her, clearly eager to show off what he found. I found this for you, Andrea. Can I have another donut now? Unfortunately, with that Idol now in Andrea’s hands, things are looking bleak for Reynold. His only hope is if Andrea decides to take this opportunity – and the power of two immunities – to blind side someone from her own alliance, a preemptive strike. Speaking of hopes, Fillip seems to be angling for a spot in the new Spike Lee joint that he shot 25 years ago. Or he’s trying out a different look: Brother Mouzone on summer vacation. 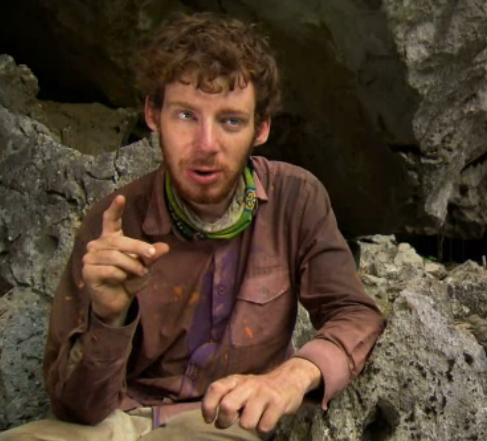 Whatever the explanation, it’s Caramoan’s hottest new fashion. 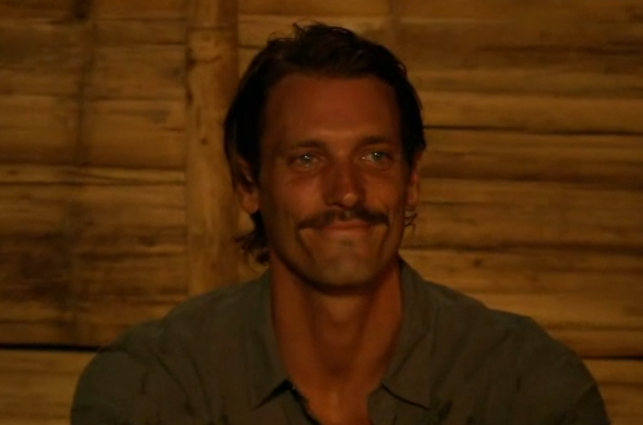 The conversation soon turns to Eddie’s decision to bow out of the Immunity Challenge in favor of a couple donuts. 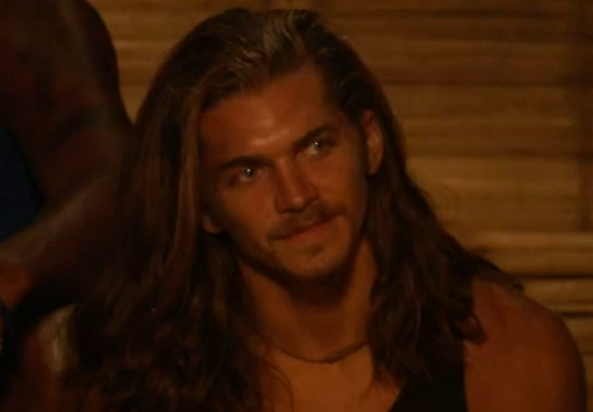 Probst wonders what other snacks would have lured Eddie out of the challenge, and Eddie offers an interesting response. Unfortunately, with no more hidden Idols to play, and no bigger bros to fry, the Favorites stick together and finally oust Reynold, after 25 votes. 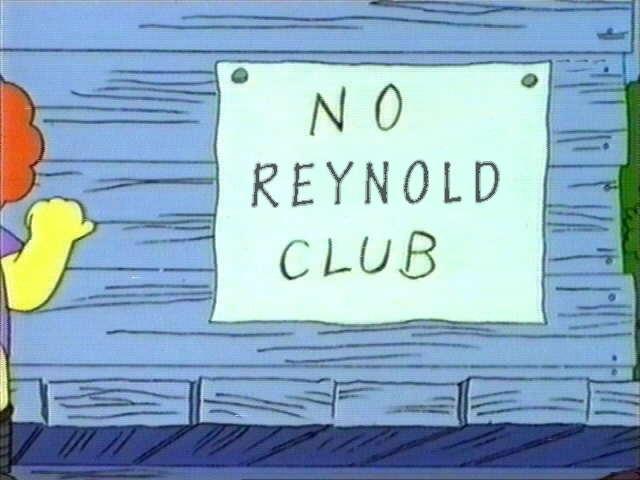 We guess they decided they couldn’t even have one Reynold after all. ALWAYS REMEMBER, REYNOLD, LOOSE GETTING PEGGED AS BEING PART OF THE COOL KIDS ALLIANCE AND STUCK ON AN INFERIOR TRIBE AND BEING A HUGE TARGET AND PHYSICAL THREAT FROM DAY ONE SINKS SHIPS. Goodbye, Reynold, sweet Prince of the Bros. But what’s that? The show is only half over? 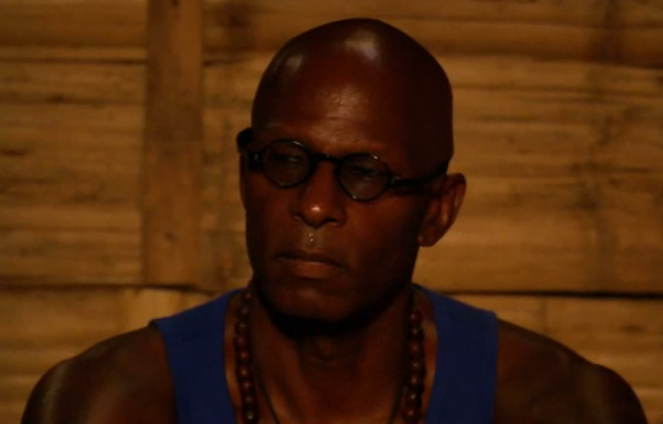 There will be another Tribal Council in this episode? Would have preferred a full 44 minutes of Reynold still competing in the game, but sure, we’ll bite. With the finale only one episode away, we understand that they have to start speeding things up. With an Idol in her pocket and faith in her consiglieres, Andrea is starting to Don Corleone it, looking for ways to consolidate her power and extinguish any threats to the family. But Cochran, to his utmost credit, it catching on. If Andrea is starting to think about slitting Brenda’s throat (FIGURATIVELY! 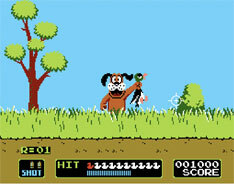 ), how long until she turns her blade towards Cochran’s neck. 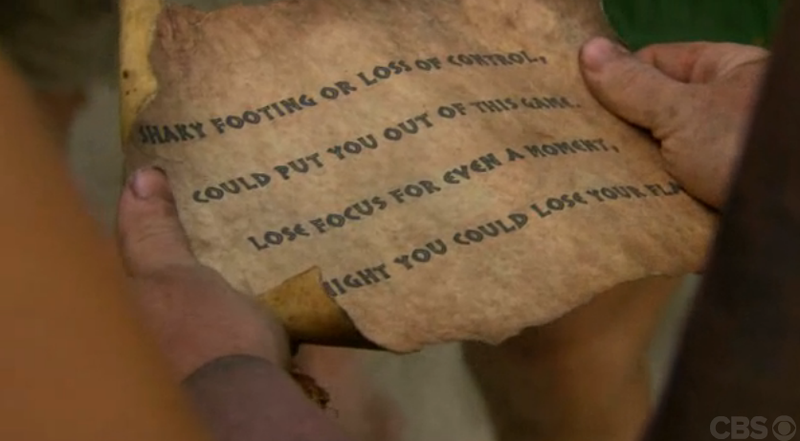 And with Andrea’s possession of that Idol, they may not get another chance to take her out. Quickly, it’s another Immunity Challenge, a ropes course and a ladder puzzle (and no reward or idol clue OR tossing element this time). With Reynold gone, any physical challenge is basically Erik’s to lose, with Brenda not far behind. Sherri – of course – falls right back into her usual challenge groove. As we predicted, Erik earns the victory, surprisingly not being undone by the ladder puzzle (the climb is all there is). Even more surprising, he doesn’t immediately hand the Immunity Necklace to Andrea in exchange for a pat on the head and a scratch behind the ear. 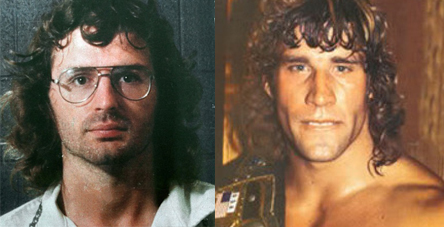 Speaking of Erik, which semi-famous dead Texan do you think he most resembles, David Koresh or Kerry Von Erich? With Tribal Council fast approaching, it seems as if Cochran and Dawn are ready to make their move on Andrea before she makes her move on them. But Erik and Sherri – still deluded into thinking they hold the power – remain the wild cards, as does Andrea’s Idol. But, more importantly, Reynold is looking to replace Michael Cera in the sequel to Youth in Revolt. Incredible work all around on the jury this week, and good for them for already looking past the game towards the next stage in their career. Those guys are making it seem like Ponderosa is the place to be. And they’ll soon be joined by Andrea, who becomes the latest player to go home with an Idol in her pocket. She took a calculated risk, choosing to trust her alliance even though she knows she herself can’t be trusted, and hoped to save her Idol for potential use later in the game. And now it’s just an awesome Survivor souvenir. By demonstrating her desire to remove her competition Andrea proved just how dangerous she is and removed herself. Having Eddie under her spell just wasn’t enough. ALWAYS, REMEMBER, ANDREA, LOOSE DONKEYLIPS SINK SHIPS. Only two episodes left. Cochran made his big move, timed it well. But did he now put the bullseye squarely on his broad, tanned, muscular shoulders?